By answering just a few questions about foods you like, how you take your coffee, and whether you like opera, it's possible to predict which Italian wine you love most. And 9 times out of 10, the prediction will be spot on. How can that be? 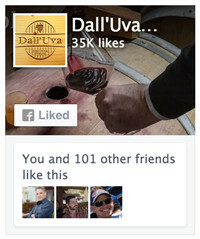 Well, it ends up that the wines you love to drink have a lot in common with other things in life that you love. Jean Anthem Brillat-Savarin famously said this back in the 1700’s, and he was spot on. 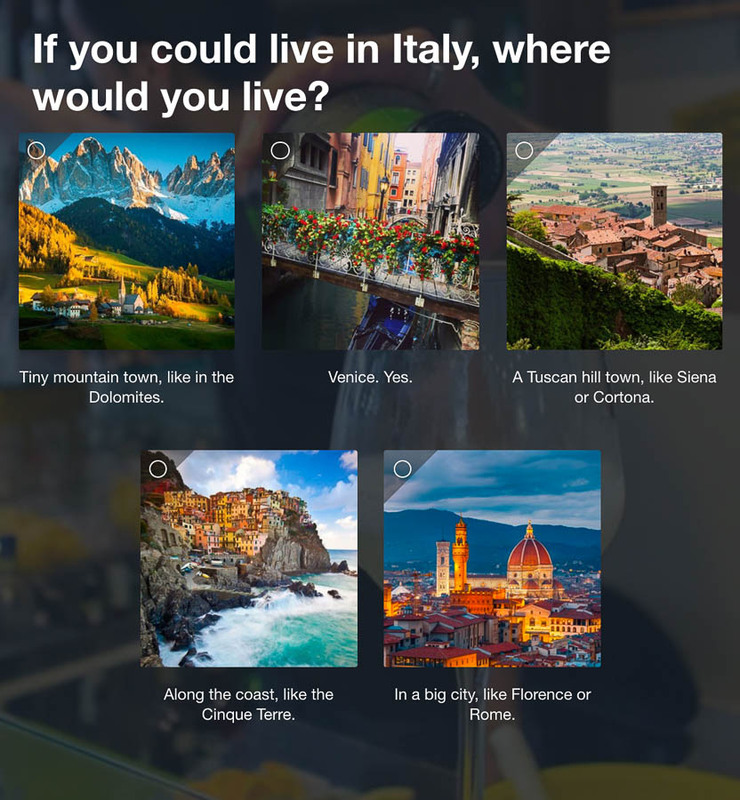 Taking his quote on a twist toward wine, I created a quiz called “What Kind of Italian Wine are You?” It was hugely popular, with nearly 8,000 people completing the quiz to find out their destiny as an Italian wine. 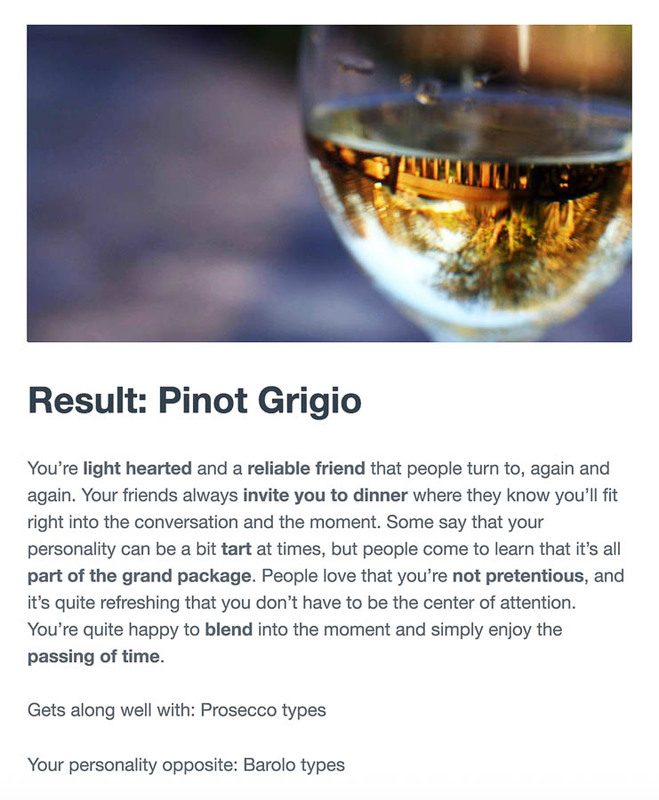 Of the 7,165 people who completed the quiz, most were pegged as a “Pinot Grigio” (34%). The next most popular wine personalities were Amarone (20%), Chianti Classico (18%), Prosecco (12%), Barolo (9%) and Moscato d’Asti (7%). I got Pinot Grigio which is what I drink 99% of the time!!! Barolo, all the way! Cheers! ??? Making the call of which wine someone is most like (and likely to love) isn’t so hard. There’s a little taste science involved, and a touch of math that pulls it all together. The quiz asks a series of 8 questions about everyday things: the foods you like, how you take your coffee, where you’d live in Italy if you could, for example. 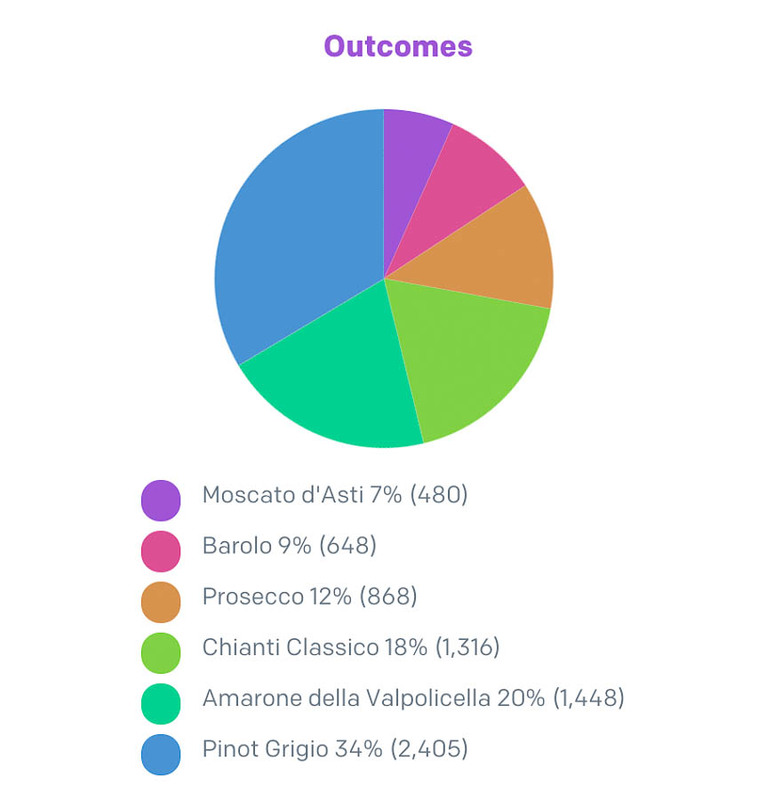 Your answers are compared to similar taste characteristics of 6 different Italian wines. For example, if a question asks how you like your coffee in the morning, and you answer it with “I like it black,” then there’s a pretty good chance you can handle (or even like) the bitterness of tannins in a wine like Barolo. If instead you prefer cream and sugar in your coffee, you probably don’t care much for bitter tannins in a wine. That means you probably prefer an Italian white wine over red, since most white wines have very little tannin. Perhaps you even prefer a Pinot Grigio. 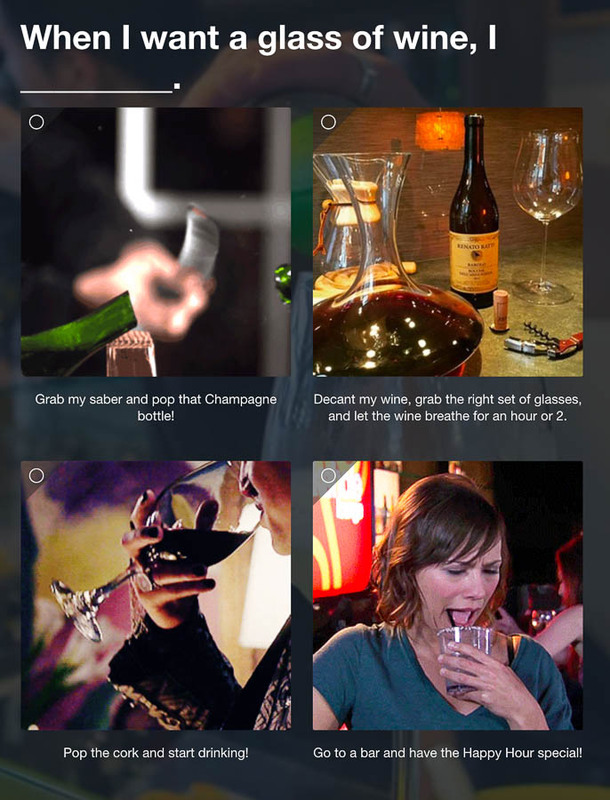 As you answer each question, the quiz builds up a profile of your tastes. 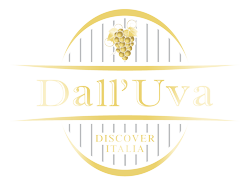 Each taste profile is compared with the taste characteristics of 6 different Italian wines. In the end, a call is made on your Italian wine destiny based on the sum of your tastes. It’s all in good fun, and while it’s certainly not 100% accurate, it is uncanny how the prediction is usually spot on. Here are the 8 questions that can predict a lot about the type of Italian wine you’re most likely to drink and enjoy. 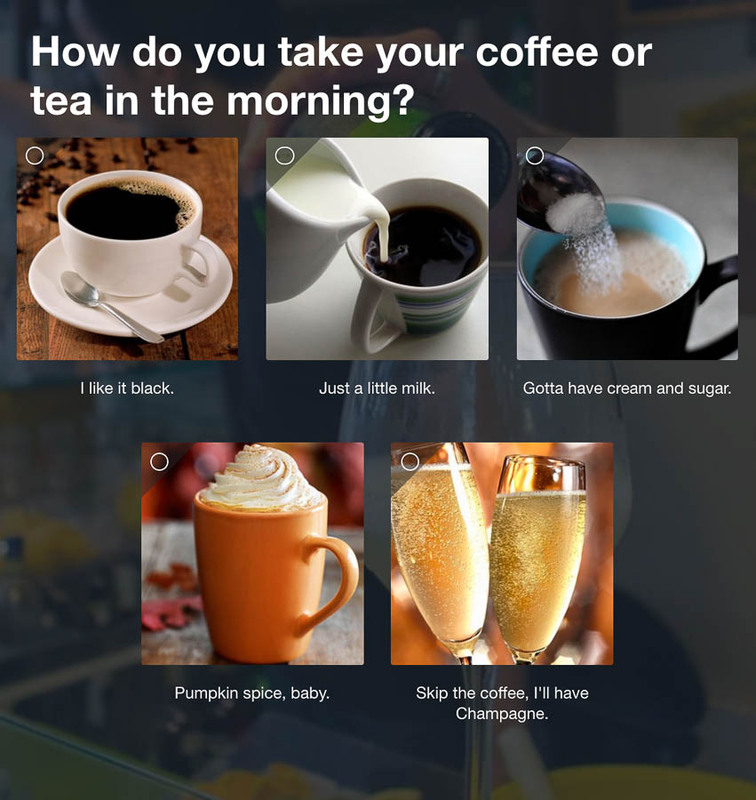 Question 1: How do you take your coffee or tea in the morning? 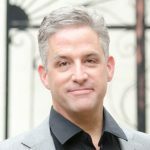 The goal of this question is to see whether you’re likely to enjoy tannins (bitterness, like in black coffee) or prefer something softer. If you’re into tannins, then you’re more likely to enjoy red wines, like Barolo or Chianti. If not, you probably enjoy white wines, and possibly even sweet wines like Moscato. 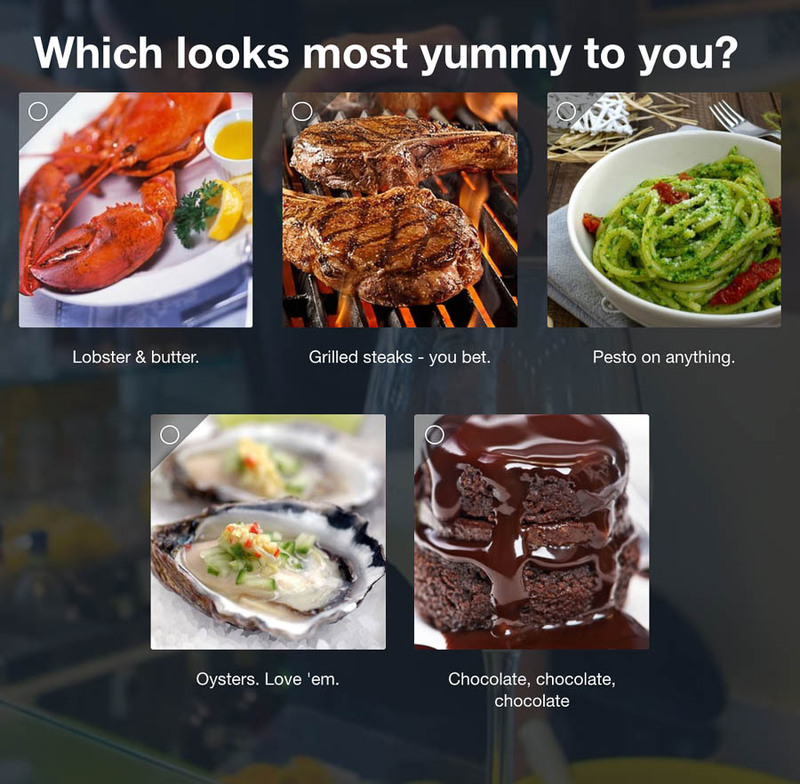 Question 2: Which looks most yummy to you? Matching food preferences to red or white wine preferences is pretty straight forward. With that, it’s possible to pick a sweet or a dry wine preference. Do you prefer chocolate cake over grilled steaks? Then you probably have a sweet tooth and might like a Moscato d’Asti. Do you prefer pesto? You probably would enjoy a white wine like Pinot Grigio. How about Oysters? Yeah? Then there’s a good chance you like bubbly wines like Prosecco. Question 3: Which Italian car would you love to drive? This is a fun question about your personal taste in cars, which surprisingly can reveal characteristics of your likely wine preferences. Are you conservative in your car choice, or do you prefer more racy cars? If you like classic cars, like a Fiat 500, you probably like more classic wines like a Chianti Classico. Prefer to drive a Lamborghini Huracan? Then there’s a pretty good chance you like Barolo. 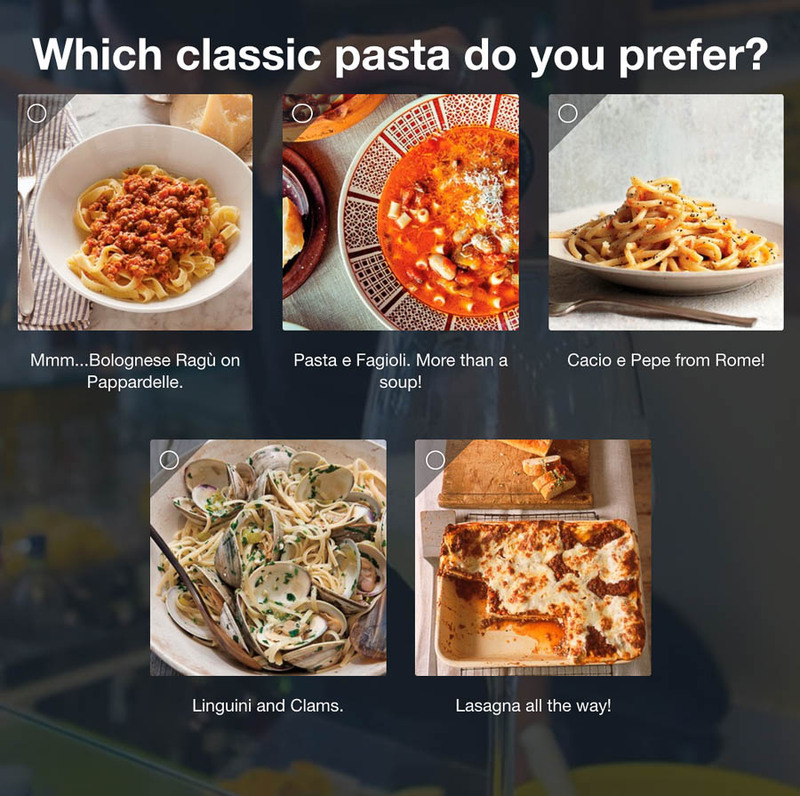 Question 4: Which classic pasta do you prefer? Here’s another food matching question that really can be quite telling. Do you prefer Linguini and Clams? Then you probably like a nice white wine, like Pinot Grigio. Do you love Pasta e Fagioli? If so, then there’s a pretty good chance you’re a red wine person, and probably enjoy Chianti Classico. Question 5: If you could live in Italy, where would you live? Wines tend to go best with the dishes of the region they’re from. And if you have visited and love Tuscany, for example, then you know that Chianti Classico is hugely popular there — and you’re more likely to drink it if you live there. Similarly, if you would prefer to live along the coast, like the Cinque Terre, there’s a good chance you’re into white wines, like a Pinot Grigio. Question 6: Which smell do you like best? 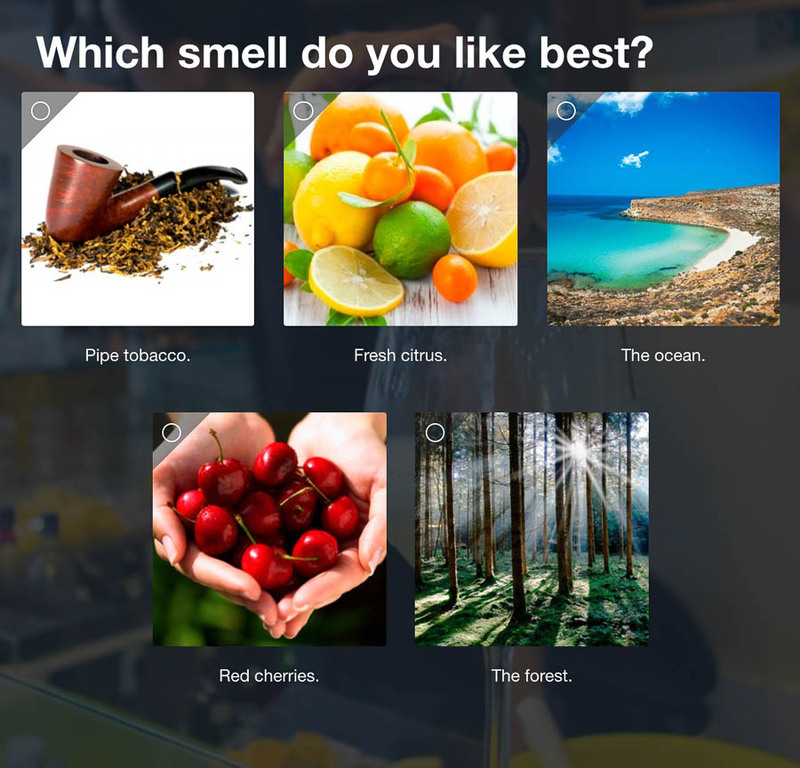 This is a classic question for mapping personal preferences in smells to the aromas of wines. If you like the smell of, say, pipe tobacco, then there’s a very good chance you’re into red wines like Barolo and Amarone. Do you prefer the smell of fresh citrus? 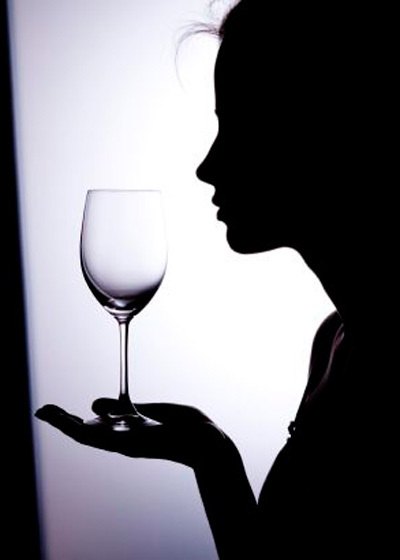 Then you’re more likely into white wines, like Pinot Grigio, Moscato d’Asti or even Prosecco. Question 7: Do you like Opera? Okay, this one was just for fun. Do you love Opera? Then there’s a better chance that you’re into more refined wines like Amarone or Barolo. 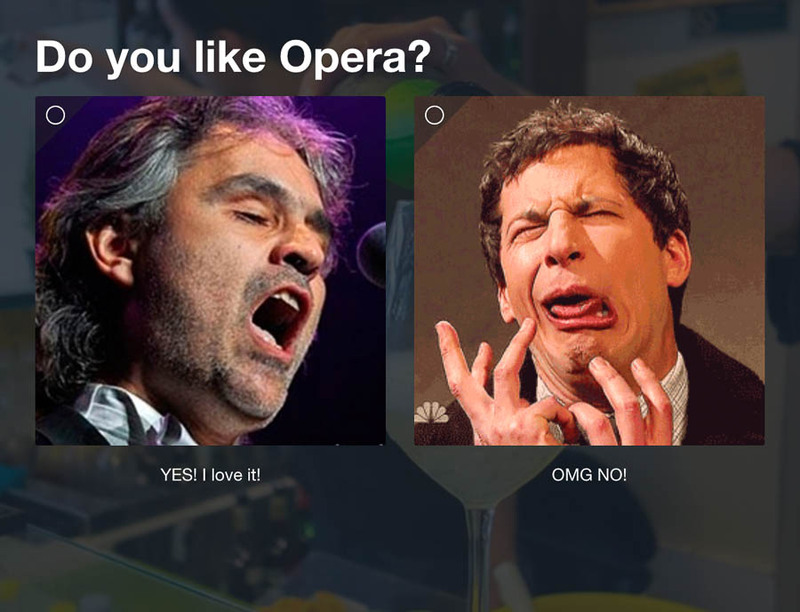 Does Opera make you cringe? Then maybe you like more approachable and easy going wines, like Chianti Classico. Question 8: When I want a glass of wine, I ______. This is an easy question for everyone to answer, and it says a lot about wine preferences. When you want a glass of wine, do you take the time to decant it, perhaps making it a ritual? Then you’re probably into complex wines like Barolo and Amarone. Would you rather just pop the cork and start drinking? Well, then you’re probably into easy drinking & no-fuss wines like Chianti Classico or Pinot Grigio. Yeah, that’s my favorite Italian wine. You might be surprised, but after answering the above 8 questions and using a little math, it’s pretty easy to pick the Italian wine that most closely matches your personal preferences. And just for fun, the results were personalized by describing characteristics of the wine as a person. You can still take the quiz and find out your own destiny as an Italian wine. How good was the prediction? Post your results in the comment section below. 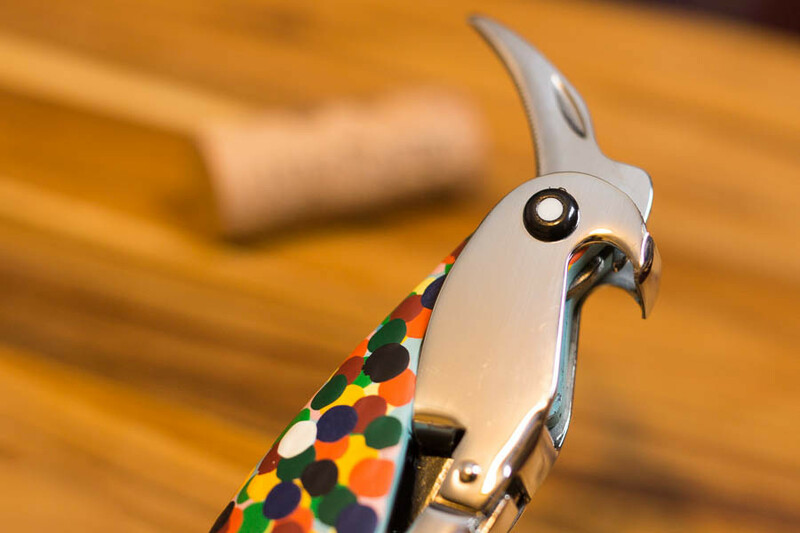 Everyone who completed the quiz had a chance to enter to win an Alessi Parrot Sommelier’s Corkscrew It’s all in good fun, and over 1,000 people entered the drawing. Joe completed the quiz and found out that he’s most like Prosecco! Joe is a fan of white wines and has a natural affinity for Northern Italy (especially Venice), so it’s quite fitting that he was picked as a Prosecco. For those of you who took the quiz, thanks for joining the fun! The next quiz and drawing are right around the corner…stay tuned!